Ribwort is a species of flowering plant in the Plantaginaceae (plantain) family. 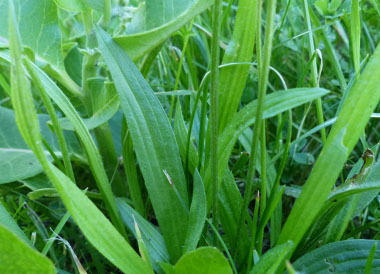 It is also known by several common names such as English plantain, narrow leaf plantain, buckhorn plantain, ribleaf and lamb's tongue. The only weed that ribwort is likely to be confused with is broad-leaved plantain yet there is a very distinct difference in leaf size and shape. This plant is a perennial, reproducing only by seed. 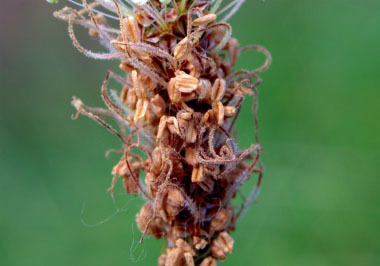 Distinguishing Features: Ribwort is easily distinguished by its rosette of long, narrow leaves with prominent, parallel veins. It has a slender, leafless stem tipped with short, dense, oval spikes of tiny flowers. This is a drought-tolerant plant so it stands out in areas that have not seen much rain. 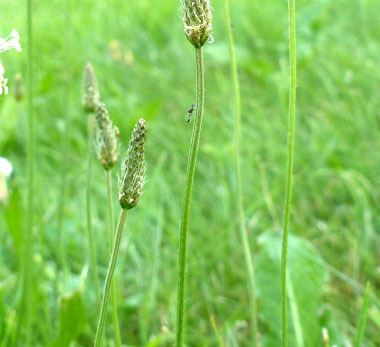 Fields of Nutrition has medicinal benefits and vitamin/mineral content of Ribwort. 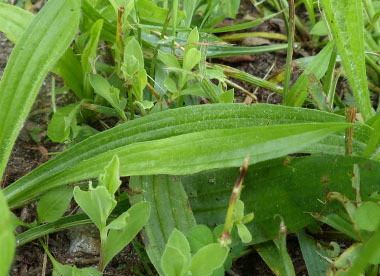 Leaves: Leaves grow in a basal rosette, stalked, and are quite erect. The blade is lanceolate–almost linear, with margins entire–sparsely toothed, sparsely haired, parallel-veined. 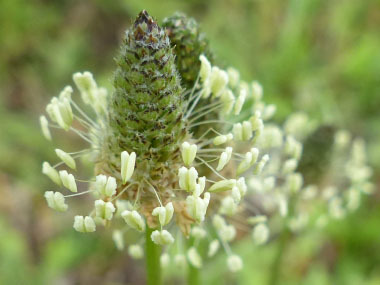 Height: Ribwort grows anywhere from 10 to 50 cm (4 to 20”). The stem is leafless, arched base–straight, clearly 5-edged, varyingly hairy scape. 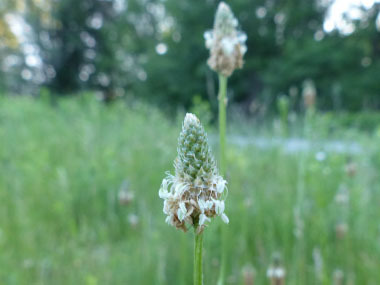 Habitat: Ribwort is found throughout North America, Europe, Iceland, northern and central Asia, Australia, and New Zealand. 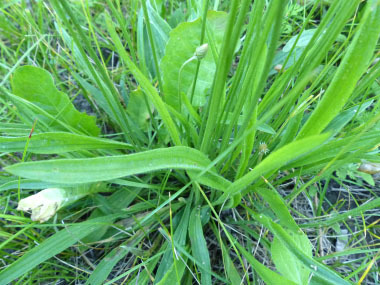 This is a common weed in lawns, meadows, dry meadows, waste ground. 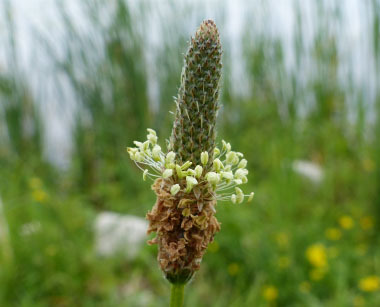 Edible parts: Ribwort can be eaten raw or cooked. The older the leaves the more bitter they will taste. They do have fibrous veins making it a little bit tricky to eat raw unless chopped. Seeds can be ground into a powder and added to flours in baking. 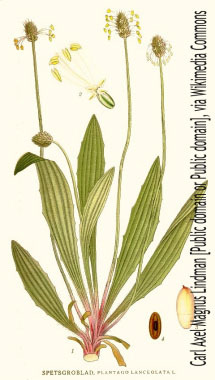 Other name: Narrow Leaf Plantain.